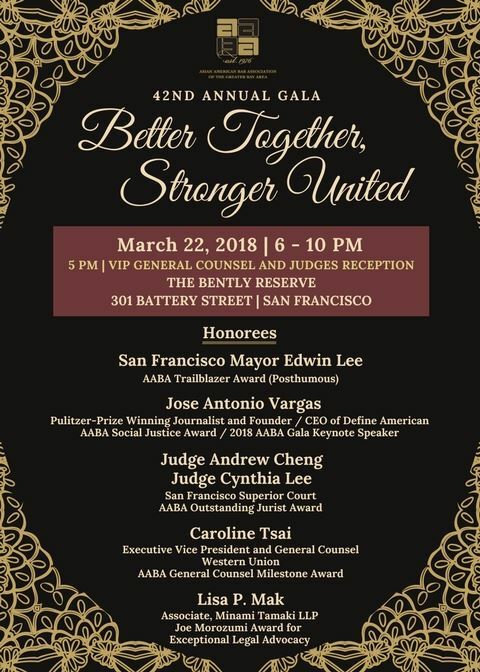 We are excited to announce our 42nd Annual Gala: Better Together, Stronger United will be held on March 22, 2018 at the Bently Reserve, 301 Battery Street, San Francisco (5:00 - 10:00 PM). It will be an evening of celebrating our community's accomplishments and building connections to continue advocating for civil rights and serving our communities. Last year, over 900 attended our sold out gala, including attorneys, general counsel, judges, students, and others in the legal community. For sponsorship opportunities, please see https://tinyurl.com/Sponsor42ndAnnualGala or contact us at aabadinner@gmail.com.